Go to original pattern for design DROPS 192-55. Knitted hat with pom pom in 2 strands DROPS Alpaca Bouclé and 2 strands DROPS Brushed Alpaca Silk. Knitted neck warmer in garter stitch and 2 strands DROPS Alpaca Bouclé and 2 strands DROPS Brushed Alpaca Silk. 50 g colour 04, light beige. 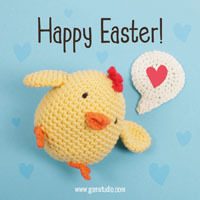 9 stitches in width and 12 rows in height with stocking stitch and 2 strands of each quality = 10 x 10 cm. DROPS DOUBLE POINTED NEEDLES SIZE 10 MM: for stocking stitch. DROPS CIRCULAR NEEDLE SIZE 9 MM: length 40 cm for garter stitch edge. 9 stitches in width and 18 rows in height with garter stitch and 2 strands of each quality = 10 x 10 cm. DROPS CIRCULAR NEEDLE SIZE 10 MM: length 60 cm for garter stitch. 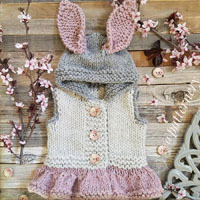 You can get the yarn to make this pattern from	22.50£. Read more. Start just after the marker thread, slip 1 stitch as if to knit, knit 1 and pass the slipped stitch over the knitted stitch (= 1 stitch decreased). The piece is worked in the round. 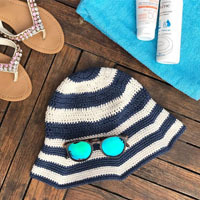 The garter stitch edge is worked in the round with circular needle and then the rest of the hat is worked with double pointed needles. Cast on 44-46 stitches with circular needle size 9 mm and 2 strands light grey Alpaca Bouclé and 2 strands light beige Brushed Alpaca Silk (= 4 strands). 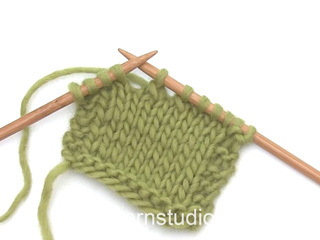 Work GARTER STITCH in the round – read description above. When you have worked 4 ridges change to double pointed needles size 10 mm. Continue in the round with stocking stitch until the piece measures 19-20 cm from the cast-on edge. REMEMBER THE KNITTING TENSION! Now insert 6 marker threads in the piece: Inset one marker thread at the beginning of the round, the next after 8-9 stitches and insert the remaining 4 marker threads after each 7th stitch. There are 8-9 stitches from the last marker thread to the beginning of the round. On the next round decrease 1 stitch after each marker thread – read DECREASE TIP. Decrease like this every 2nd round a total of 4 times = 20-22 stitches. Knit 1 round. Then knit all stitches together 2 and 2 = 10-11 stitches. Cut the strand, pull it through the remaining stitches, tighten and fasten well. The hat measures approx. 27-28 cm from the top down. 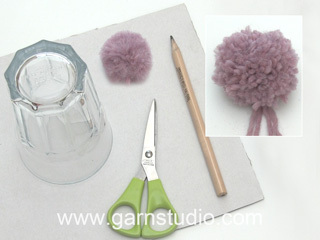 Make one large, slightly loose pom pom of approx. 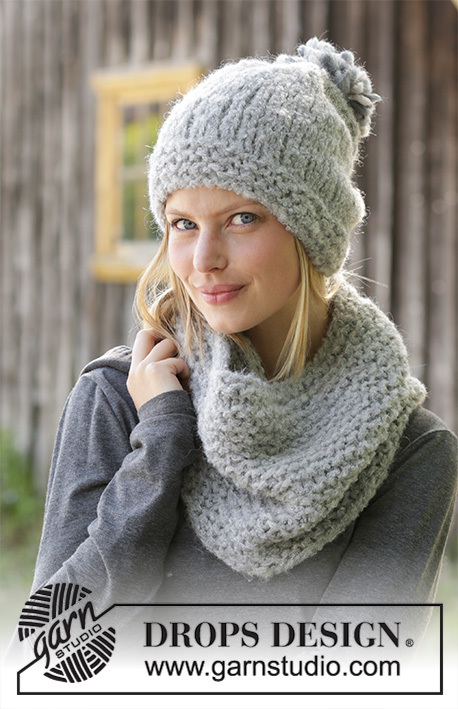 10 cm with light grey, light beige and medium grey Eskimo and fasten to top of hat. The piece is worked back and forth with circular needle. Cast on 54 stitches with circular needle size 10 mm and 2 strands light grey Alpaca Bouclé and 2 strands light beige Brushed Alpaca Silk (= 4 strands). 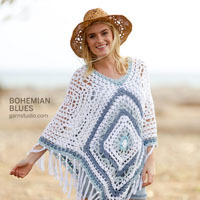 Work GARTER STITCH back and forth – read description above. REMEMBER THE KNITTING TENSION! When the piece measures 18 cm increase 5 stitches on the next row as follows: Knit * 10 stitches, make 1 yarn over *, work from *-* a total of 5 times and finish with knit 4 = 59 stitches. On the next row knit the yarn overs twisted to avoid holes. Continue working until the piece measures 26 cm. 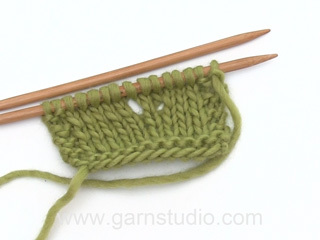 Cast off with knit, but to avoid the cast-off edge being tight you can make 1 yarn over after each 5th stitch. Yarn overs are cast off as normal stitches. Sew the neck warmer together mid back. Sew using 1 strand of each quality (= 2 strands) and sew in the outermost loop of the outermost stitch so that the seam is flat. Cut and fasten the strands. Witam. Pompon ma mieć średnicę 10 cm. Jakiej wielkości należy zrobić koła z kartonu, żeby otrzymać pompon tej wielkości? Witaj Ireno! W kole z kartonu musisz na środku wyciąć otwór. Aby pompon miał średnicę 10 cm, szerokość obręczy, która zostaje po wycięciu musi mieć 5 cm. Jak wykonać pompon znajdziesz TUTAJ. Powodzenia! Buonasera Eliana. Sì, deve lavorare con 4 fili. Buon lavoro!